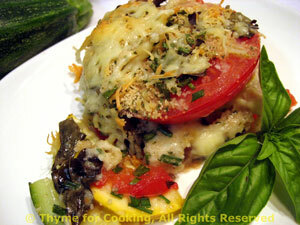 Tomato and Zucchini Gratin, healthy seasonal gourmet cooking. Thin slices let the flavors meld together easily. The bread crumbs between the layers soak up all the goodness from the tomatoes and the zucchini.... All topped with a golden, cheesy crust. This will be enough for 2 meals.